The 2018 Television Critics Association Awards recognised the spy-drama with three nods including program of the year, outstanding achievement in drama and individual achievement in drama, for Keri Russell. The improbable in TV has happened. FX’s The Americans has gone from television on a high note. Yup, saying goodbye this year with its sixth and final season, the 2018 Television Critics Association Awards (TCA) recognized the spy-drama with three wins including program of the year, outstanding achievement in drama and individual achievement in drama for Keri Russell. With great competition from last year’s winner Handmaid’s Tale - that won both Program of the Year and Outstanding Achievement in Drama - The Americans has finally gotten their due with these victories. Having had a niche following with both critics and fans since inception, The Americans is about Elizabeth and Philips Jennings, a Russian spy couple, living in eighties American suburbs, serving the KGB while trying to avoid an ensuing chase with the FBI and blending in as a normal, American family. In spearheading the series, both Matthew Rhys and Keri Russell delivered their career-best performances, something that consequently won the show nominations on several occasions at other award shows like The Golden Globes, Primetime Emmy Awards and some wins at American Film Institute awards. Told with great nuance, the seductive show is mostly about Mr. and Mrs. Jennings, essayed by Matthew Rhys and Keri Russell, their relationships and the choices they must make for their family, which includes having a young teenage daughter. Their loyalties to their country of origin, Russia ( Soviet Union) and their country of living, America remain one of the core issues of the series. The Americans, generally winds up losing when it comes to awards. Keri Russell and Matthew Rhys are probably the most underrated actors on television with so many award nominations including the Emmys to their credit that it is hard to keep track. But finally, the show’s last farewell season had enough meat that it won them awards ahead of many others. Losing to Keri Russell was fan and critics favorite, Sandra Oh, for her outstanding performance in BBC America’s new crime series, Killing Eve. 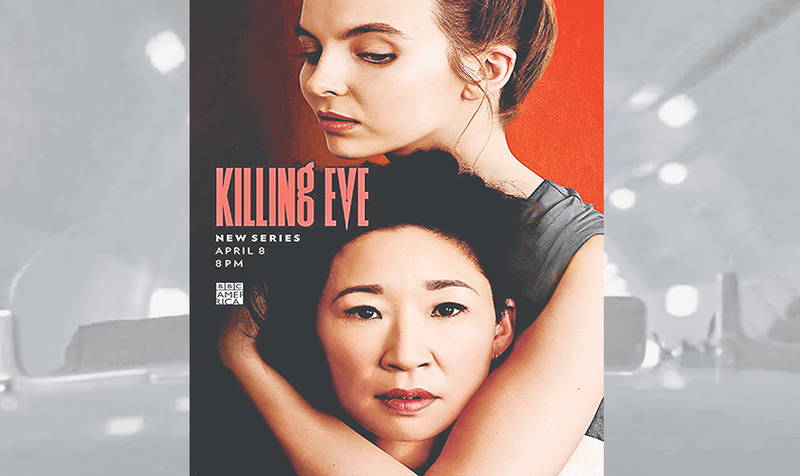 But Oh has another shot since Killing Eve has been renewed for a second season. However, Killing Eve did end up winning the award for Outstanding New Program, (thanks to the women who led the show including Sandra Oh) beating out last year’s excessively overrated winner, This Is Us. Achievement in Comedy also had a new winner this year as NBC’s The Good Place, beat out last year’s winning series Atlanta. The underrated comedy starring Kristen Bell and Ted Danson is about The Good Place i.e. (Heaven), where only the best of the best individuals end up. Kristen Bell’s Eleanor Shellstrop lands in the good place by some clerical error and her antics create chaos in heaven. Meanwhile, The Marvelous Mrs. Maisel, a comedy created by Amy and Daniel Palladino, who also created The Gilmore Girls, also had its moment. The series about a fifties housewife, who starts doing stand-up comedy may not have won any awards in major comedy categories but its lead star, Rachel Brosnahan, took home the trophy for individual achievement in comedy, beating out last year’s winner, Donald Glover. The overrated Ryan Murphy series, Assassination of Gianni Versace: American Crime Story, which realistically wasted actors as fascinating as Penelope Cruz ended up winning the trophy for Outstanding Achievement in Movie or Mini Series, most probably because of its star studded cast and lack of stiff competition in the category. What is most remarkable about TCA 2018 is that it recognised new winners in almost all categories, and celebrated those whose victories were well-deserved and long overdue.